First wireless controls, then motion controls, then motion-tracking like the Xbox Kinect... sooner or later, someone's going to come up with a computer (and therefore a video game) that can be controlled entirely with our minds. Well, turns out it may be "sooner"—a research scientist at the New York research lab the Wadsworth Center has demonstrated that not only can computers already understand basic language-related thoughts, people can shoot Doom demons… with their minds. As reported by Computerworld.com, Schalk showed a video with test subjects who had electrodes attached to their brains. Schalk presented attendees a video showing how test subjects can control computer games through the use of electrodes attached to the surface of their brains. The test subjects were already wired for treatment of illnesses such as epilepsy. 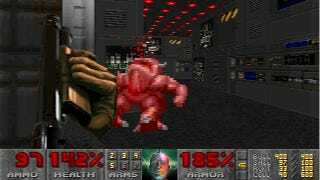 In one demonstration in the video, a patient used thoughts to shoot monsters in the video game Doom. The patient used a joystick to move the gun back and forth but used his thoughts to cause the gun the shoot — accurately. In another demonstration, Schalk showed how a computer can tell the difference between someone thinking the sounds, "Ah" or "Ooh." A third demonstration a computer detecting the sound level of music a person was listening to and track it moment-by-moment. As much as I make light of the science fictiony feel of being able to control a video game with my mind, this is some huge, fantastically interesting stuff. One of the biggest things holding many people back from playing video games is the control-scheme—gamers spend many years mastering the 20-odd buttons on a 360 or PS3 controller, and it takes countless hours of practice before the bridge between our brains and the controller breaks down a bit and we feel truly connected to a game. Playing Dance Central 2, I've been struck by how immediate the game feels, since true to Microsoft's marketing buzzwords, my body really is the controller. So imagine if a game allowed direct brain interaction! The mind boggles. This may only be the tip of the iceberg, but it most certainly is the start of something more intense and groundbreaking. For now, we'll just have to imagine the possibilities… with our minds.